Pankaj leverages his integrated acumen to map different technologies with clients’ unique business problems. He is also involved in creating digital strategies, solutions and architectures for field force and asset intensive enterprises. He supports deploying Azure PaaS Solutions to transform enterprises’ legacy systems and shift them to Cloud Premises. Pankaj’s 18-year entrepreneurial stint consisted of his co-founding and managing an IT Infrastructure Services Organization. He scaled this organization from 0 to 4000+ active customers in the first two years itself. With an intent to shift to Cloud Infrastructure, he joined Saviant. 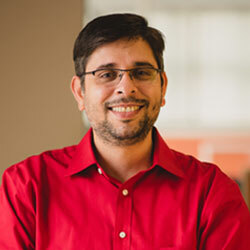 Pankaj holds an Advanced Diploma in Software Engineering. Pankaj is an avid adventure sport enthusiast. He holds a Diploma in Mountaineering and often rides on motorcycles around the country.